The latest firmware version was released on the 1st June 2018. As the first Signal K gateway, iKommunicate is pioneering many of the new features and functions of this exciting Open Source Marine Data format. 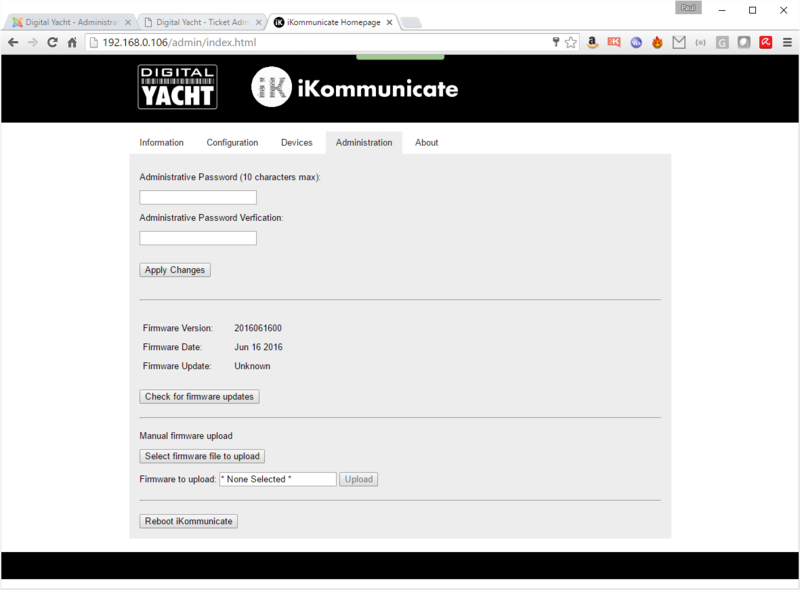 Neither Digital Yacht or the Signal K developers are expecting to get things right first time and we have designed iKommunicate to be easily updatable, so that we can quickly fix bugs, add new features and keep in-sync with the Signal K specification as it evolves. 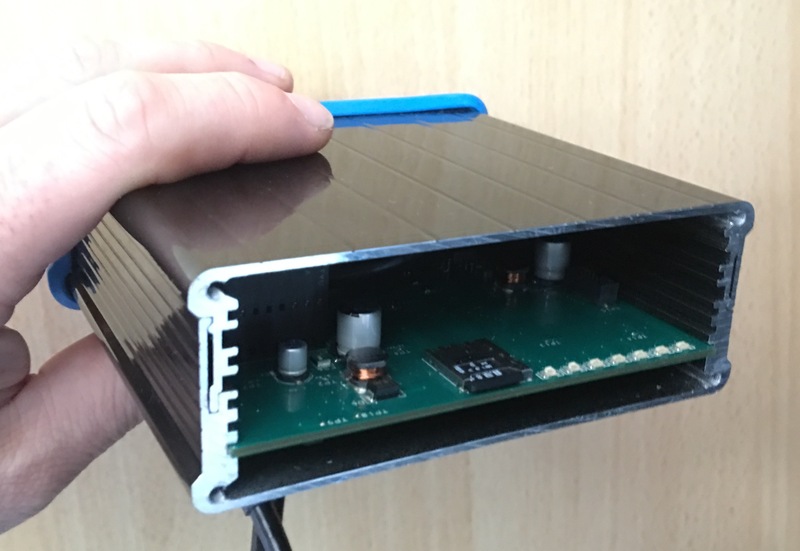 At least in these early stages, we have decided to refer to firmware versions by a simple release date, rather than a firmware version number but this may change in the future when things start to stabalise and the rate of change slows down. Below is a screen shot showing the latest web interface with the Automatic Online Update option which you access by clicking on the “Check for firmware updates” button and the new Web Upload to SD Card option, accessed by clicking on the “Select firmware file to upload” button. The Automatic online method is by far the easiest but does rely upon the boat’s Ethernet network, that iKommunicate is connected to, having a good internet connection. This can be problematic on boats, as I am sure many of you have experienced, so the new Web Upload is a useful addition. You can download the firmware to your laptop, tablet or smart phone and then once down on the boat, go to the web page shown below and upload it to iKommunicate. The final method, if all else fails, is to manually copy the firmware file to the SD Card. This involves turning off all power to the iKommunicate unit, removing the four screws that hold the plain end cap (one with no connectors) and carefully pushing the micro SD Card in to the connector, to release it and then pulling it out. 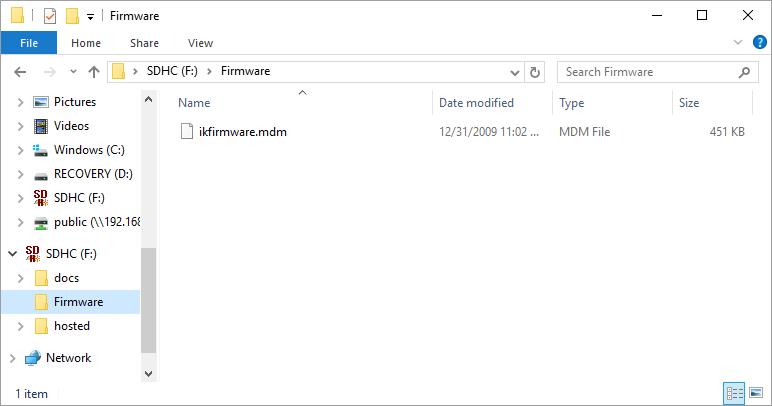 With the micro SD Card inserted in to a card reader or card slot on your computer, extract the downloaded firmware file and make sure it is named “ikfirmware.mdm”. Then copy it to the “Firmware” folder on the micro SD Card, as shown in the image below. When the copying is finished, right click on the SD Card entry and select “Eject” which is always good practice, in case the file had not completely finished copying. Re-instert the micro SD Card in to the iKommunicate, making sure you gently press it in to the connector until it clicks and is properly retained in the connector. Re-assemble the end cap and apply power again to iKommunicate. After 20-30 seconds the firmware will be copied to the iKommunicate flash memory and the unit should finish rebooting as normal. The latest firmware version dated 1st June 2018 can be downloaded by clicking here. Don’t forget to unzip it and use the “ikfirmware.mdm” file inside. The latest SD Card Image V2.01 dated 1st June 2018, which includes the new iKommunicate build, can be downloaded by clicking here. To install; remove your micro SD Card from the iKommunicate (see above for instructions), insert it in to your PC/Mac/LINUX computer and do a quick format or permanent delete of the cards contents. Then extract the contents of the ZIP file to the micro SD Card’s root folder. Properly eject the micro SD Card to be sure all files are not corrupted and re-insert the micro SD Card in to the iKommunicate. EngineDynamic/TransmissionDynamic/Postiion updates being throttled too much going into the namespace.